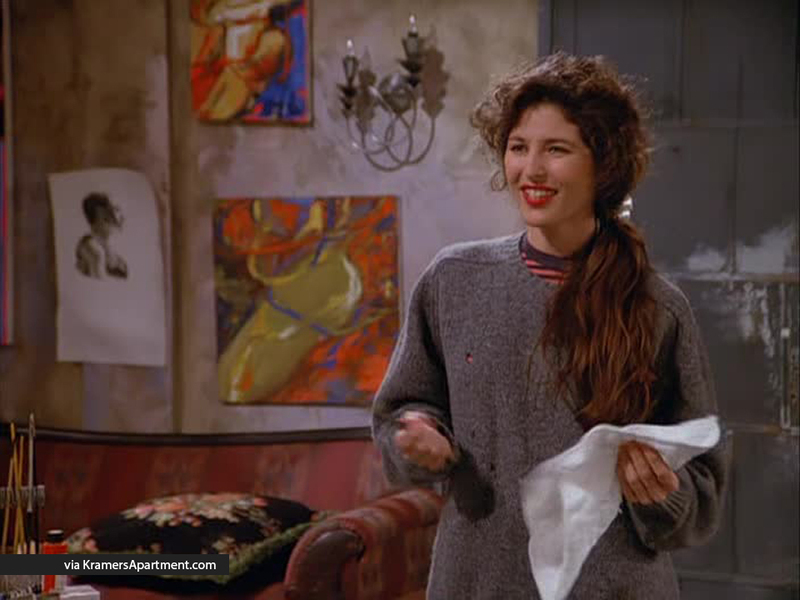 Jerry dates Nina the artist who paints a portrait of Kramer. When she offers George her father’s tickets to the owners box at Yankee Stadium, he reluctantly purchases a painting for $500. After an argument, Nina sends Jerry a breakup letter but he realizes that she plagiarized the letter from a movie. Kramer: Are you getting the eyes? ‘Cause they’re brown. (beat) Or, really, they’re dark brown, like rich, Columbian coffee. Nina: But, they’re still friends. Kramer: Oh yeah, they’re like this (holds up two fingers together). Nina: Don’t you think that’s strange? Kramer: Why, what’s the difference? Kramer: Well, you know… I, uh… have many relationships. Jerry: Hi, Nina. This is my friend George. Nina: How nice to meet you, I’ve heard a lot about you. Jerry: Hey, look at this guy! Jerry: I brought George up to see some of your paintings. George: Um… yeah! Sure, sure I’m interested. Nina: Great! Well, take a look around. Pick out something you like. Nina: My father gave me four tickets to the Yankee game for Saturday afternoon. Owner’s box, first row behind the dugout. Jerry: Oh, Saturday… I’m working, I’m going out of town. Nina: Oh, well. I’m not gonna go without you. Do you guys want ’em? 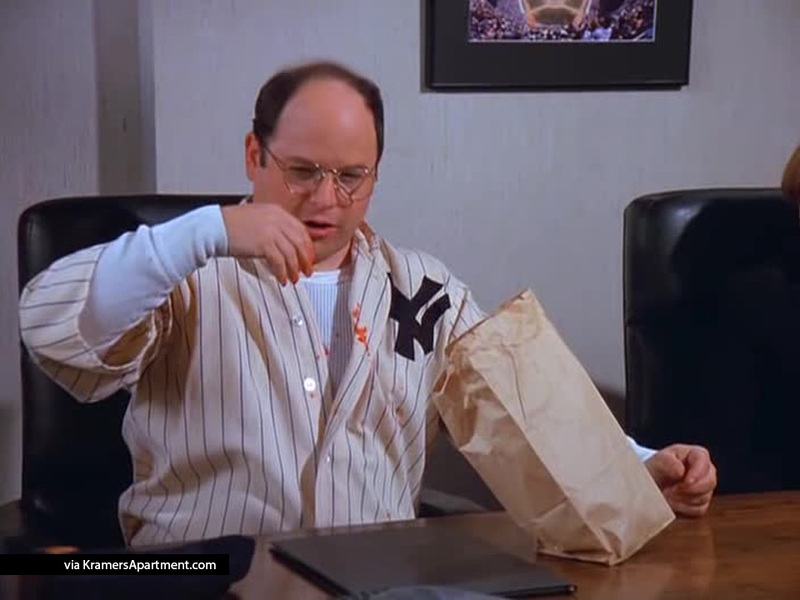 Jerry: They’re right behind the dugout, George, first row! Nina: Oh, my father’s the Yankees accountant… it’s the owner’s box. George: All my life I’ve dreamed of sitting front row, behind the dugout! Nina: (gesturing towards a small, ugly painting George was apparently looking at and happens to be holding) You like that one? Nina: She was a guest of my father’s. She should’ve taken the cap off. 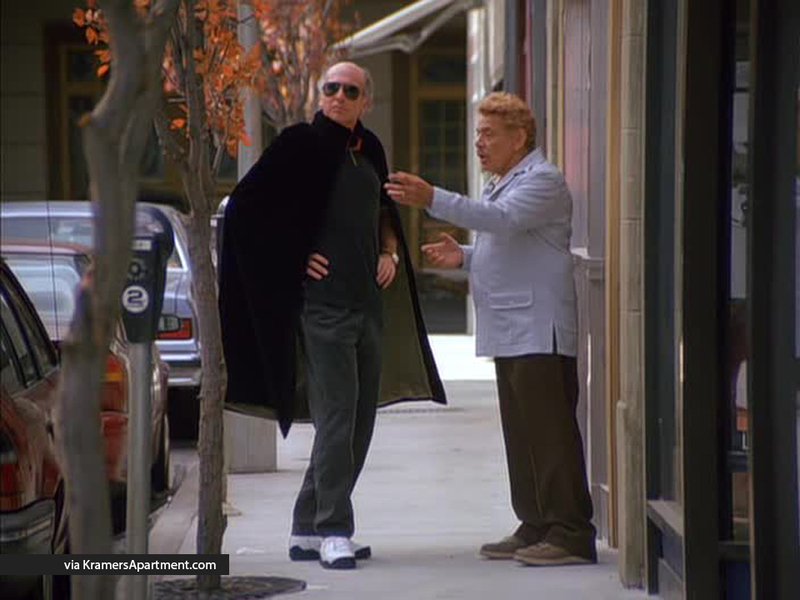 Jerry: It’s preposterous! They ask someone to take off a baseball cap at a baseball game. (beat) How can you defend that? Jerry: Look, I’m really getting tired off all the fighting. Maybe we should just end this before we really start hating each other. Nina: Oh, well, you wouldn’t want that because you always have to remain friends! Nina: Hey — why don’t you just go then! And — oh, give this to George. Tell him he owes me $500! Jerry: The appeal of the posse? The posse has tremendous appeal. Get away from the job, camp out, you’re with your friends… Come on, it’s a week-long game of hide-and-seek on horseback. George: Hey, Nina! I owe you some money, don’t I? George: Oh, yeah, me too, me too. Boy oh boy oh boy…! You know, in fact, I’ve been thinking about it, and I feel like I’m stealing from you! 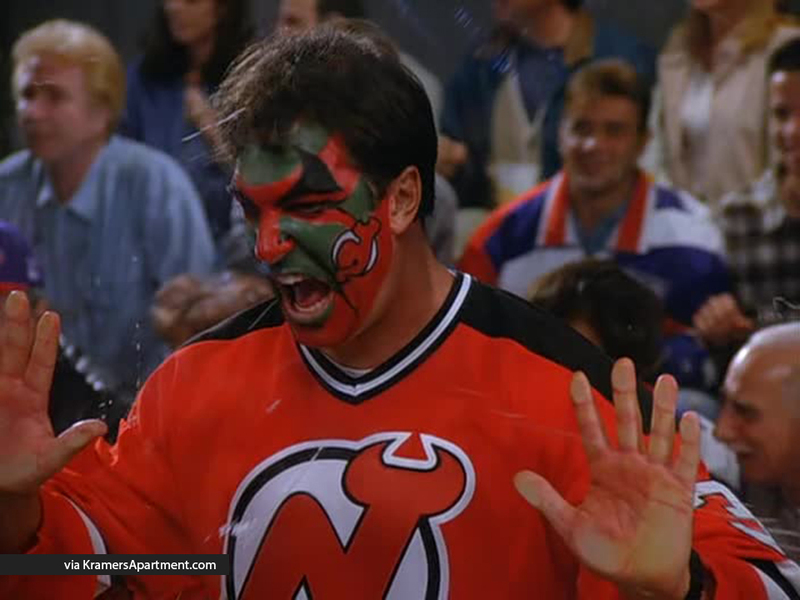 Five-hundred dollars! It’s gonna be worth thousands soon! You know what? On second thought, I can’t even accept it. Nina: No, no no no, George! A deal’s a deal. I want you to have it! George: This could be in a museum some day! It’s not safe with me! It should really be in a doormanned building. Nina: Honestly, George, the money’s not important. George: Who said anything about money? Nina: This person does not believe in telephones, does she? Jerry: She likes the pop-in. I’ve told her how I hate the pop-in.